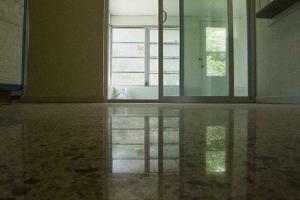 There are a lot of misconceptions associated with terrazzo restoration. 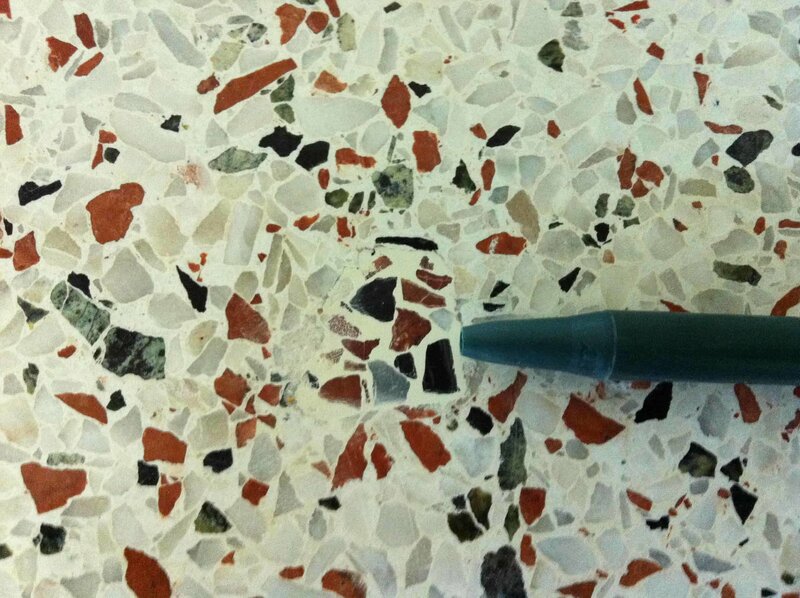 This blog is an attempt at dispelling some terrazzo restoration myths. When a terrazzo restoration sales person comes to your door, their job is to sell you on their company and technique, as well as on themselves. Unfortunately, many companies oversell themselves and their system to win the job. If someone promises you a perfect floor, they are not being honest. 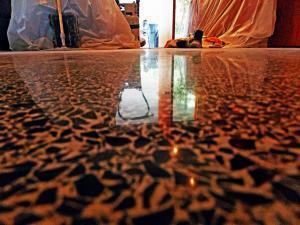 Antique terrazzo flooring seldom comes out perfect. If you restore an old car you can use a bonding agent and paint the surface. 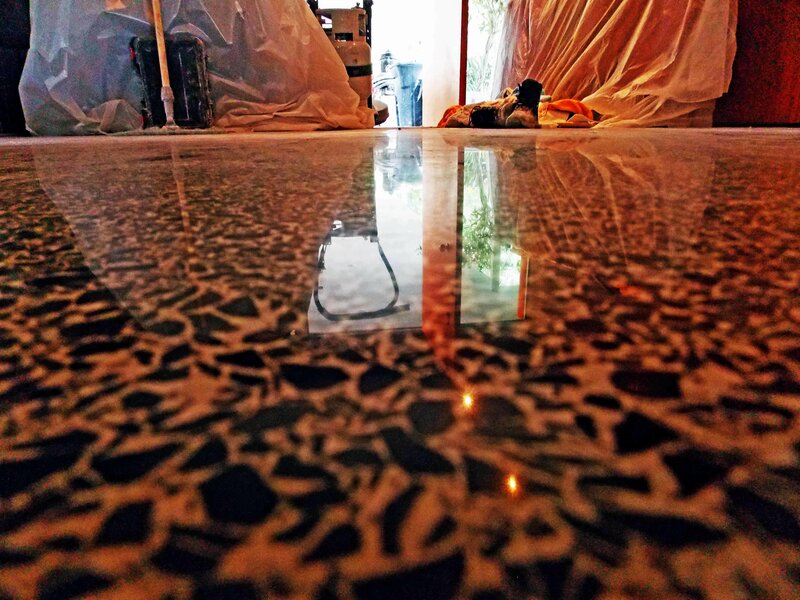 Terrazzo imperfection cannot be painted away. If you fill a hole it may blend perfectly, but it may not. Over the many years, I have restored terrazzo. My techniques and results have gotten better and better. Most of the time many or all the holes are hard to find. Our goal is to get the holes to blend with the floor so they do not stand out. If you like what you read on this site please like us on Facebook at the top right and bottom of this page. Thank you for your support. 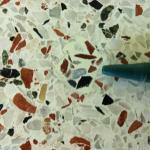 Myth: Terrazzo flooring is old-fashioned. Everyone covers it these days. 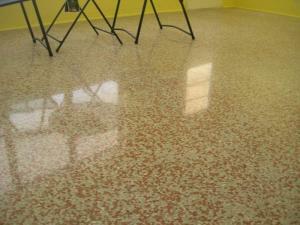 Terrazzo flooring is, absolutely, one of the most durable, long-lasting, beautiful flooring on the planet. 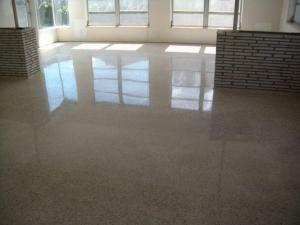 The main product is most terrazzo is Marble. When these floors are diamond polished they resemble a marble floor. No grout, a high shine and breathtaking look. 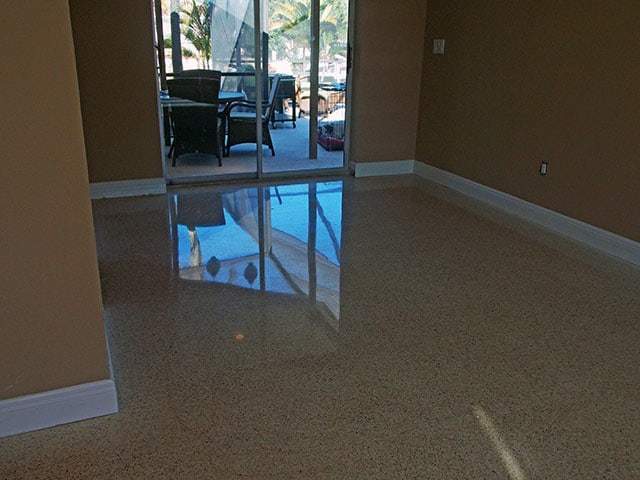 A properly restored terrazzo floor is the focal point of any home. I have restored terrazzo that was over one hundred years old. 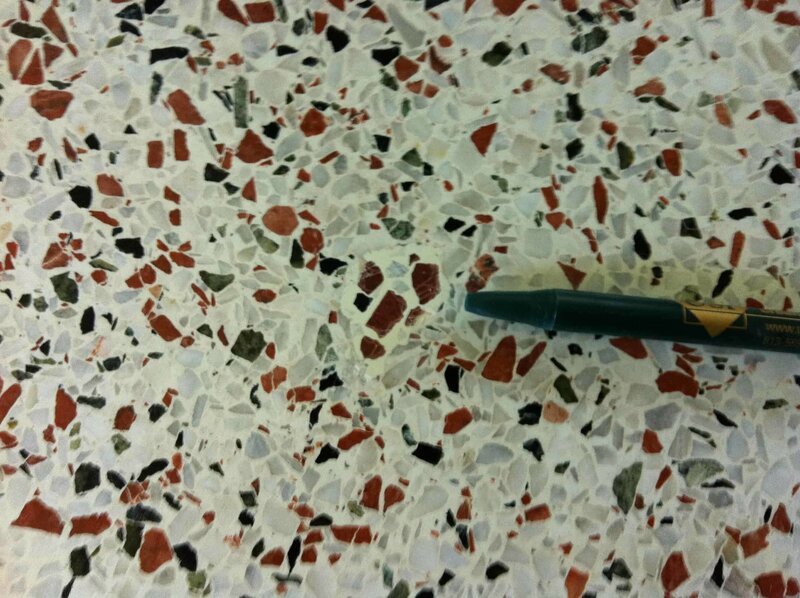 When terrazzo is properly restored, you grind off the top layer then hone and polish to a brilliant shine. Try that with any other floor. Once polished it can stay looking great year after year. 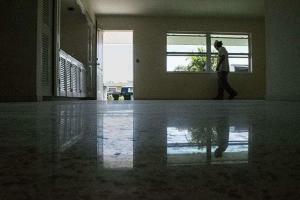 In homes, a properly restored terrazzo floor typically last eight to ten years. If you take your shoes off and keep the floor clean and free of sand it can still look great after twenty years. 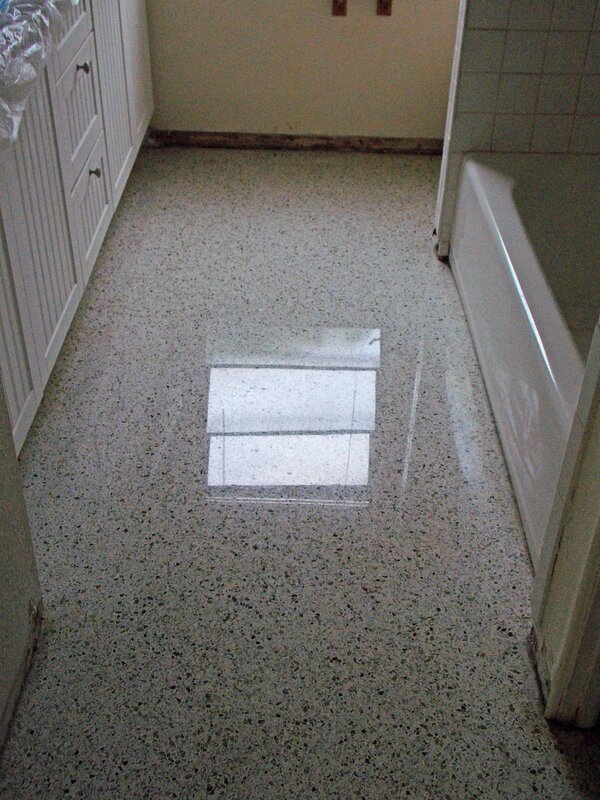 Once the terrazzo is looking dull, you simply need a polish up. At that point, you are back to the shine you had after the original restoration. 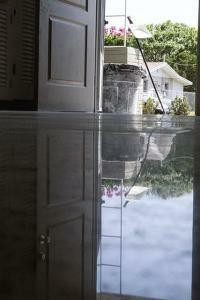 Myth: A floor can look good with only three steps, or without metal bond diamond grinding. 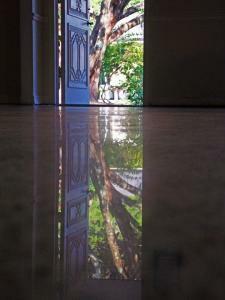 Three step polishing on an old Portland cement terrazzo floor will not make the same reflection and clarity of a terrazzo floor restored through proper mechanical diamond polishing. Proper mechanical diamond polishing includes metal bond grinding. 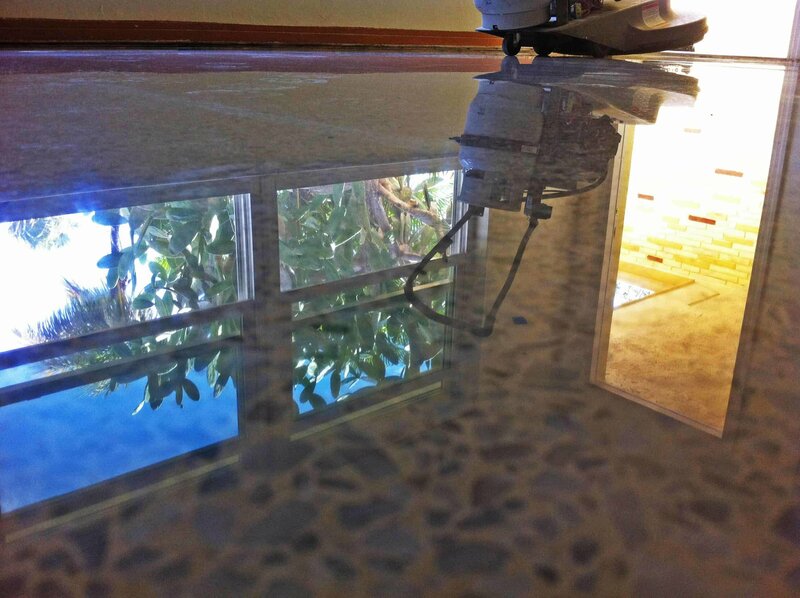 Many imperfections in a floor only become clear once the terrazzo floor shines. At this point in the restoration, you would have to go back several steps in the terrazzo restoration process to repair these imperfections. Three step processes depend on skipping the early steps of grinding and honing. 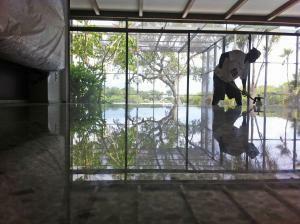 Metal bond diamonds and planetary grinding systems work to flatten the terrazzo floor. With a planetary grinding system, we use two 400 pound machines that have three heads each and while they spin one direction their entire head counter-rotates. We’ve tried many three-step systems over the years. They all failed to create the adequate clarity and reflection, not to mention low areas on the floor that are missed in a three-step system. Some companies produce a non-shiny floor and try to recrystallize, or use last step polishing powders. Recrystallization is generally used to skip several steps and cut the need for tradesmen. Quality does not come with shortcuts. Remember that a terrazzo restoration cost that does not take into account value is a rip-off. A terrazzo floor done right will have a high shine, no topical finish or topical sealer and last for years and years before needing any polishing. Re-crystallization, crystallization, vitrification are all the same thing. In my opinion, as well as most experts I know, this kind of restoration does not last as long and damages terrazzo and marble flooring. Many floors I have seen with re-crystallization have swirls and scratches in them. 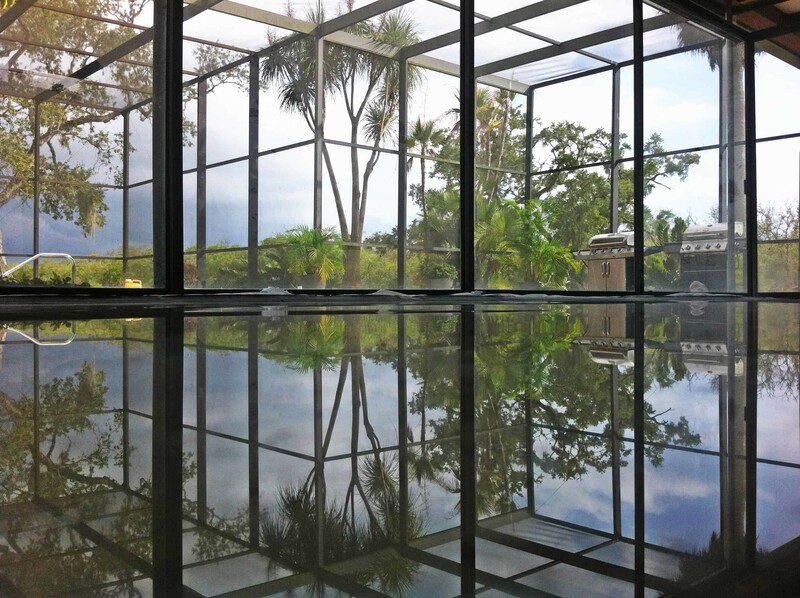 If you use this process, you can get a shine even though the floor shows poor workmanship. I am not saying all these companies do a bad job, but in the end you get a terrazzo floor that needs rebuffed every one or two years. The floor is completely sealed, so it cannot breath. This will, most likely, damage the terrazzo floor. When we pull ceramic tile, we often find moisture underneath. This is not the case under the thin-set. This moisture can take several months to escape. 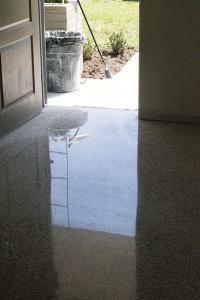 Ceramic tile slows the moisture release of the terrazzo. 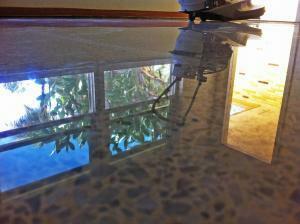 Terrazzo and concrete breathe moisture naturally. Imagine what happens when you seal the top and no moisture can travel through? I have seen recrystallize floors that were ambered several shades darker than what the floor had been. 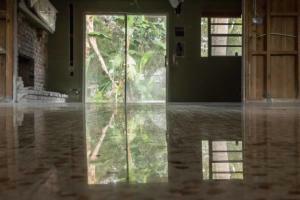 As moisture travels up in a recrystallize floor, it stops just before reaching the surface and travels sideways to escape. This is much like what we see from ceramic tile, but generally, when we see ghosting caused by moisture under ceramic tile, it covers 60-70% of the area under the tile. When you recrystallize, the moisture has to travel all the way across the floor and out. As it travels, it damages the floor. That is the opinion of many who know the science behind these techniques. When giving prices for restoring chip holes I have heard customers say “The other company doesn’t charge to fill chip holes. They said ‘It is easy’ to fill these chip holes. As most companies simply fill the chips or holes with a white binder, level it, and later come back over the holes and chips with markers to paint rocks. We spend more time preparing for the hole to be filled than they spend on the entire process. We pigment the binder to match the Portland cement. 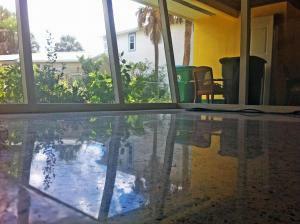 Florida’s antique terrazzo flooring used hundreds of different types and sizes of stones. In order to get a great match, you have to train your techs for several months to pigment properly, carry thousands of pounds of rocks, and train technicians to properly level the floor after filling the hole or chip. 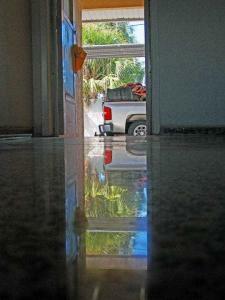 Most homeowners do not know that chip holes from carpeting are the majority of terrazzo floors in Florida. I am often asked if there is anything to be done to repair them. 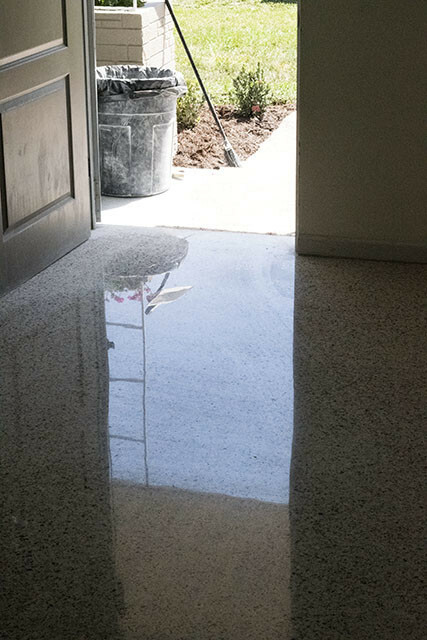 There are many ways to fill holes and chips in terrazzo flooring. I heard a story about one of them. This company is used in a couple of examples. The restorer was filling holes with white binder without any other pigment. After it cured he was painting rocks on the top. A worker was in the house doing something else and commented, “I don’t think the owner will be happy with that. The restorer responded, “People love this, everyone loves this.” Well, the owner hated it. White binder without pigment will stand out across the room. We never paint rocks on the patch. We start with a UV stable white epoxy. We match that epoxy with pigment as closely as we can to the Portland cement. Once we fill the holes we add rocks that match the stones in the floor. If the stones are still available then we have them. We fill the hole to above the level of the floor then grind them down flat the next day. We feel this gives the best result possible. 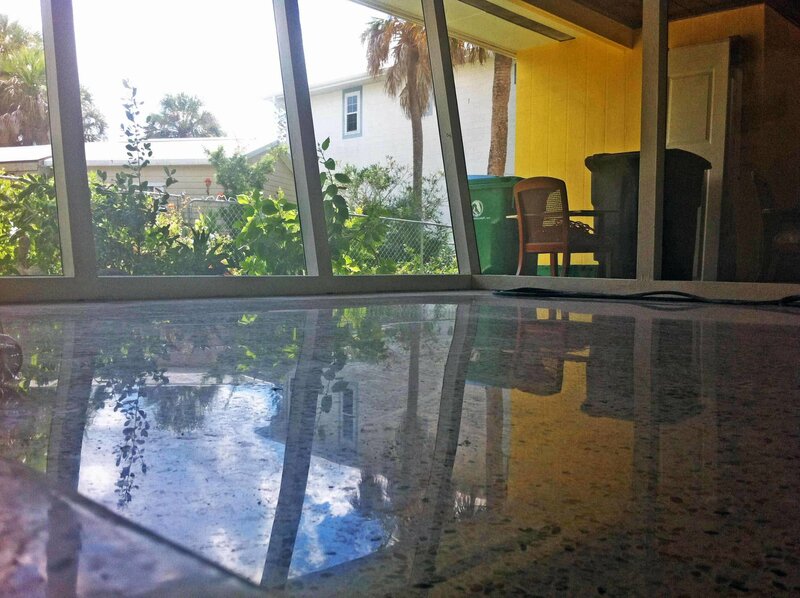 I got a call from a guy in Marco Island who wanted to know how terrazzo was properly restored. He hired a company that did his 1600 square foot house for just over $2.15 a square foot. Two men worked on the job and said the floor was ground and coated. In my opinion, for two men, to prep, grind, hone, clean and coat that many square feet in a day is hard to imagine. The math doesn’t add up. When the floor was done the coating was coming off the next day. You could see large areas that were just skipped or missed with their grinding tool. That job would take me two crews, four men and three days to restore. We would not grind and coat. I recently bid for another job where a company rep said: “His machine weighs 400 pounds and mine weighs 150. I just need to do more passes and I will have the same result.” That is a myth we dispelled when we did the job after him. Buffers spin at 175 RPMs. Our planetary grinders spin 150 RPMs in one direction, While the three smaller heads spin up to 1400 RPMs simultaneously in the opposite direction. This allows us to smooth out the floor much more effectively. Even if your machine weighs eight hundred pounds but is not planetary you will still have a hard time matching the results of a 400 pound planetary grinder. I lost this job to the other company. When they did the job they only used three grits. The floor had no shine at all. When that company was finished the man called us to start over and do the job right. 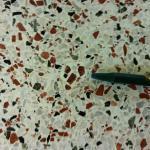 There are many ways to restore terrazzo. None of them include shortcuts without sacrificing something. 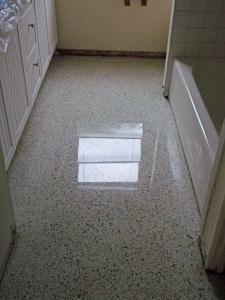 I can tell you, if a terrazzo floor could be restored in three steps I could save a lot of money. I feel the system used by SafeDry is superior to any in the industry. Remember: price and value are not synonymous. We start as low as 25 grit metal bond diamonds and go up to 3000 grit. 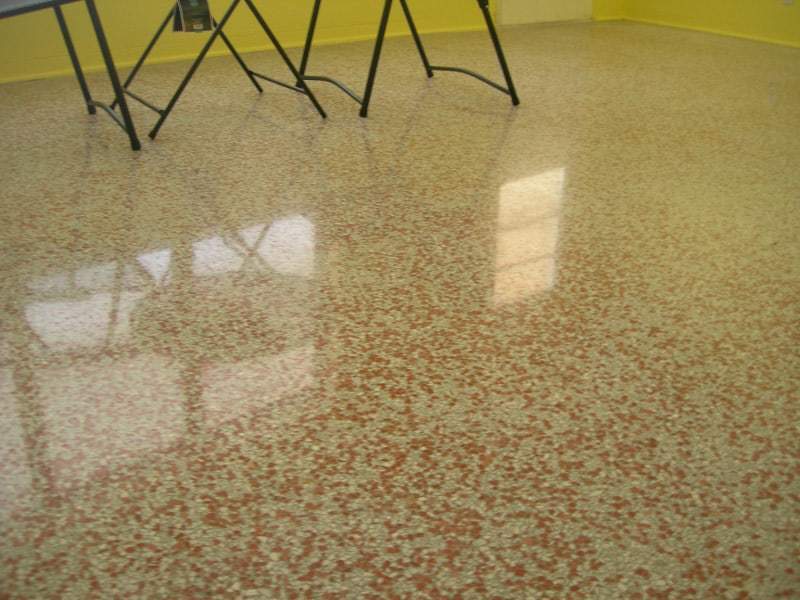 We do 3000 grit with two different systems to ensure the shiniest terrazzo floors possible. Over the years we have tested many diamond polishing systems. Most diamond tooling is made for concrete. Our system is designed for marble and terrazzo. Just because a company does up to three thousand grit does not mean their floor will match ours. Our current diamond tooling gets the most out of the diamonds and our planetary grinders. Check out the great shine. 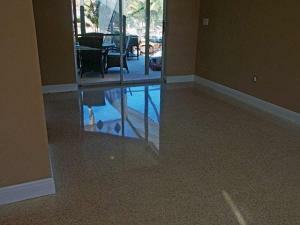 Diamond polished terrazzo is non-slippery terrazzo. When you use shortcuts, such as recrystallization or finishes, the floor is not finished with diamonds. With recrystallization, the top of the floor’s molecular structure is changed. Finishes coat the diamond finish. 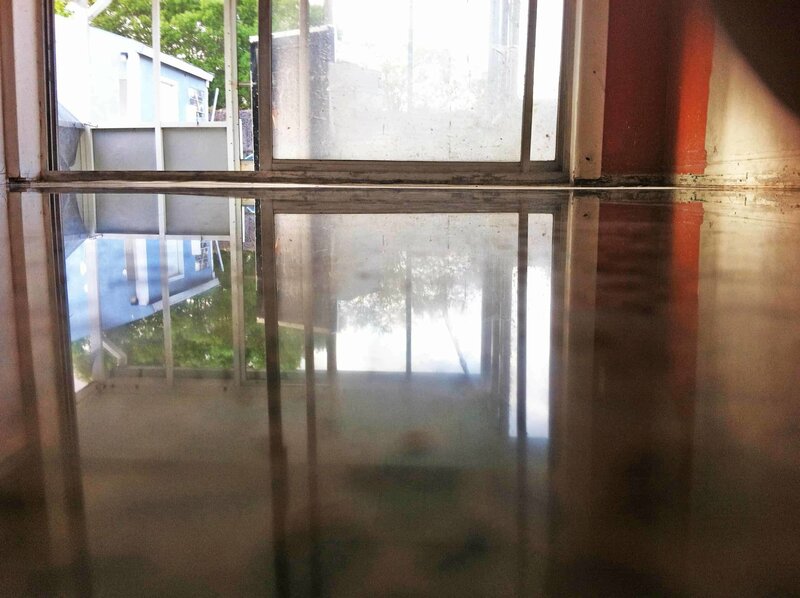 Diamond restored floors are always less slippery and fall well within OSHA standards of .5 coefficient of slip differential, wet or dry. 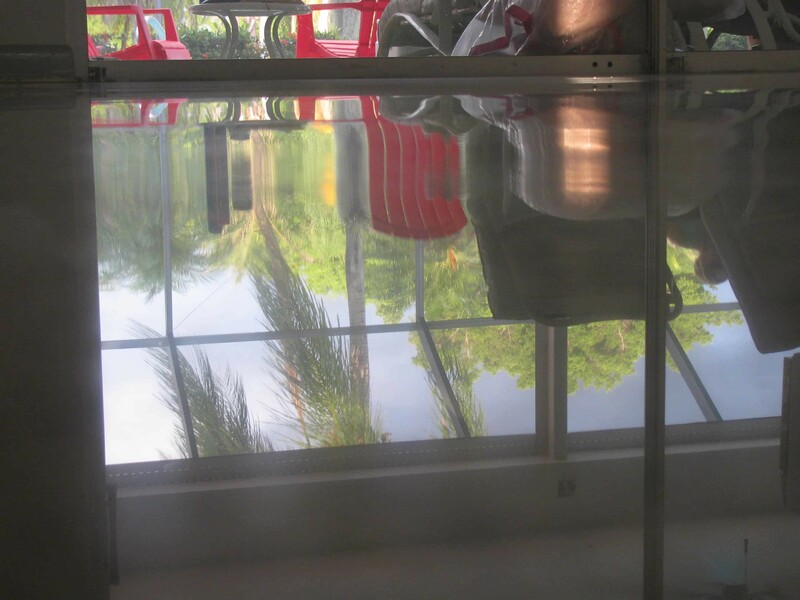 The picture above is from a house where a company told the owner he did not want a shiny floor as it would be slippery. If you took off your shoes and tried to slide across this floor you might fall forward on your face. 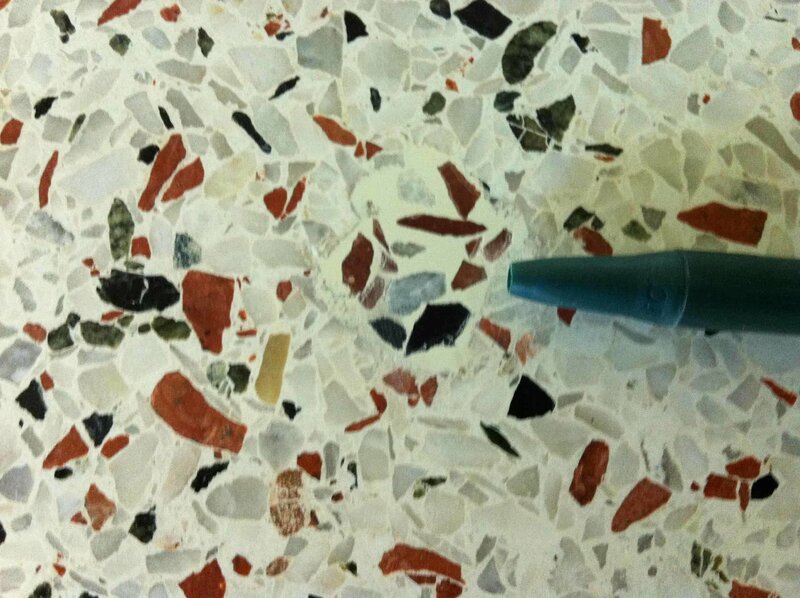 I challenge any company to show a better terrazzo restoration picture then the ones above. I will always spend the time in research to make sure my floors are the best looking floors. There are no shortcuts. 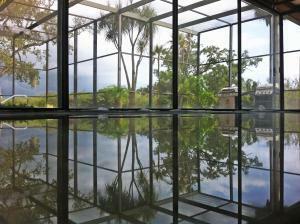 If you want a floor to look good you must put in the time to get the floor to look great. I feel that powders and recrystallization, while producing a nice floor, do not give you the best, longest lasting floor. If you start with diamond grinding and use all diamond grinding and polishing you must train your people patience and diligence to get the best results. When you get there my experience is you make the shiniest, longest lasting floor. Check out some more of our pictures just taken the week this page was first posted. 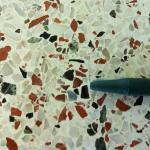 I hope this page will help to dispel a few terrazzo restoration myths. 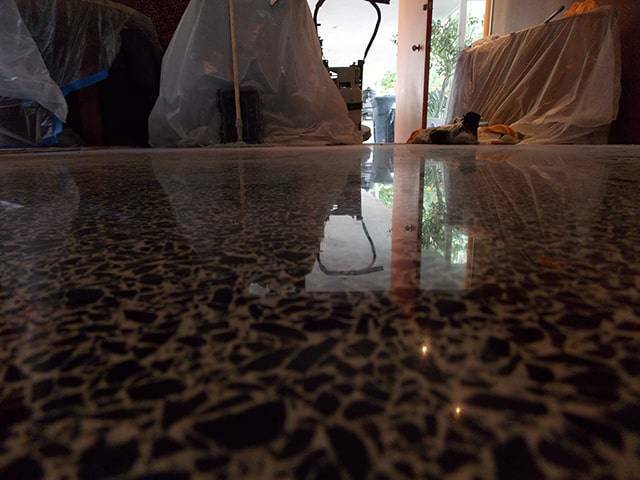 If you would like more information on terrazzo restoration, check out our blog: Terrazzo Restoration A to Z.